A big highlight for me of traveling around Central and Eastern Europe is the chance to take in all of the different types of architecture. I enjoy historical styles like Gothic and Baroque as much as anyone, but my heart belongs to modern. By modern, I mean styles that came of age in the 20th century: Art Nouveau and Functionalism, of course, but also a bit of Socialist-Realism and Retro-Futurism tossed in. 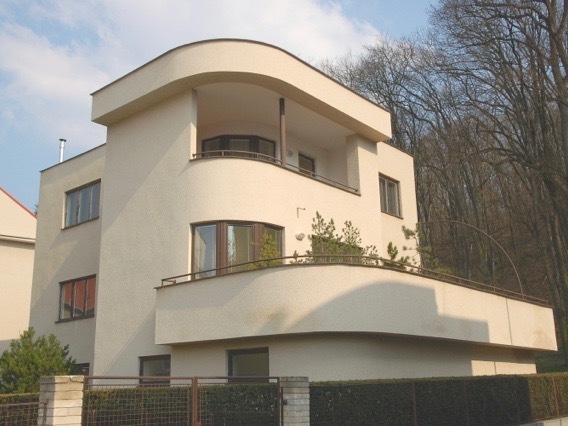 Fans of Functionalism – which reigned supreme from about 1925 to 1935 -- need look no further than the southeastern Czech city of Brno for their fix. I learned all about Brno's amazing architectural heritage working on a story for the 'Wall Street Journal Europe' a few years ago. Here below is a revised version of that story. Top Photo: Between the two world wars, the Czech city of Brno was the unlikely spot for some exciting architectural experimentation in new, modern styles that were then emerging. Here is the archway inside a pavilion at the city's exhibition grounds. Photo by Mark Baker. Posted in Diversions, On The Road and tagged Architecture, Bauhaus, Brno, Czech, Czechia, functionalism, history, modern, Moravia. 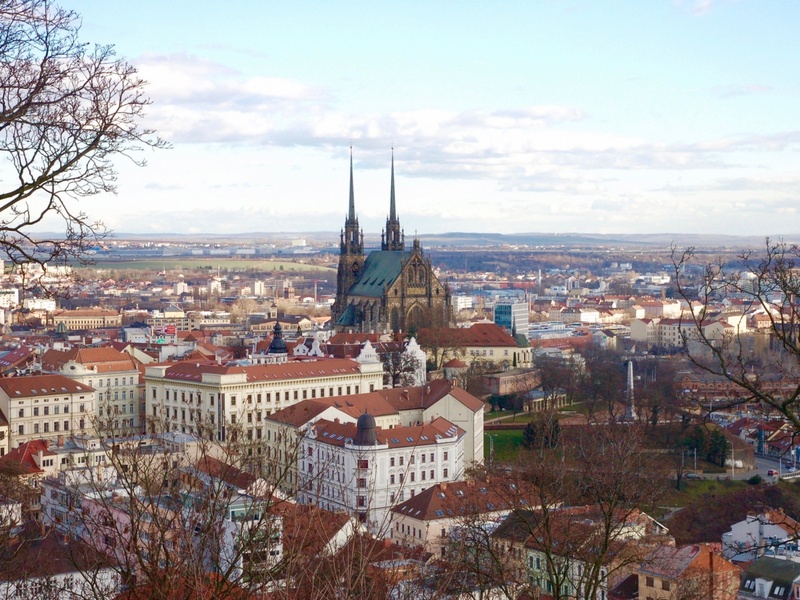 Brno is the bustling capital of the Czech province of Moravia. Trams run down the middle of busy Masarykova street. Photo by Mark Baker. The stark, clean lines of the Villa Tugendhat's front facade. The simplicity was intentional as a way of stripping away unnecessary ornamentation in favor of using high-quality materials. Photo by Mark Baker. 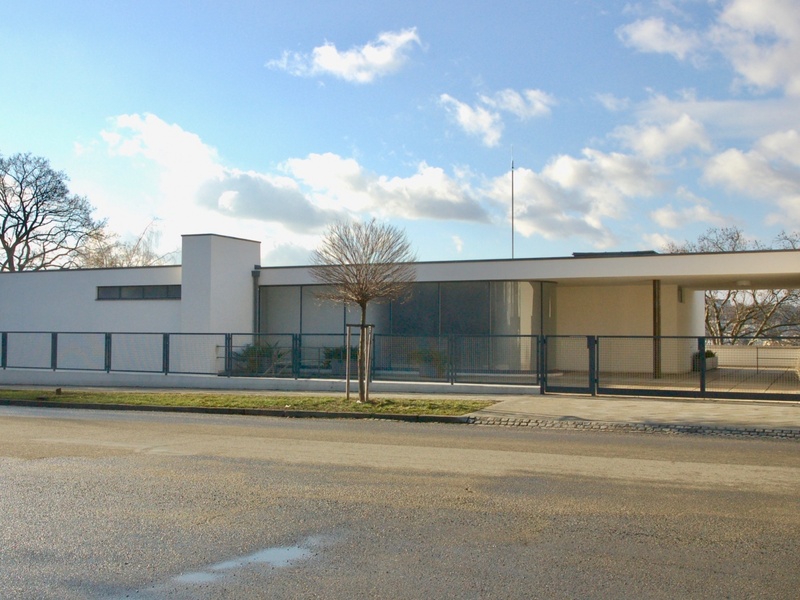 The Villa Tugendhat as viewed from the street. For years, the villa was neglected, but it has recently emerged from a long-term renovation. Visits are by guided-tour only, booked in advance. Photo by Mark Baker. From a distance, the Czech Republic's second-biggest city looks like just another Central European celebration of Gothic and Baroque, but dig a little deeper to find a trove of modern architecture. Photo by Mark Baker. 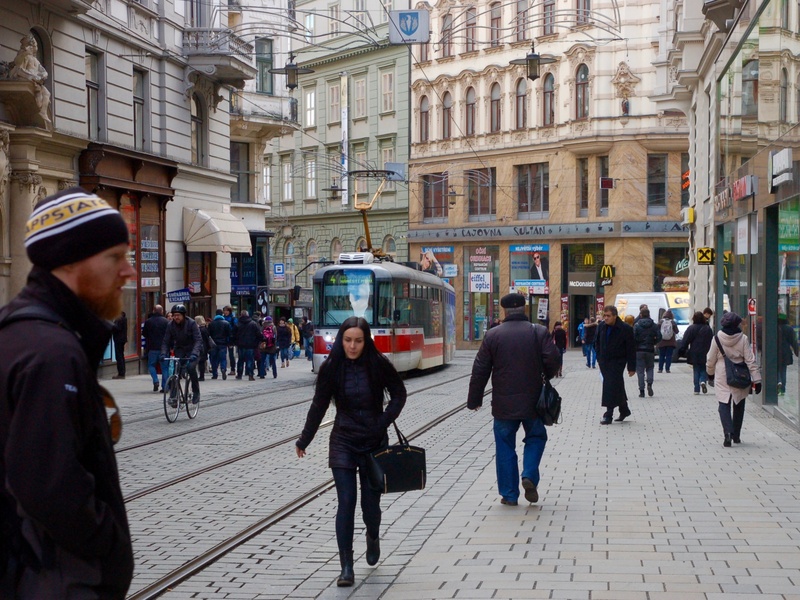 It's not easy being Brno, the Czech Republic's second-biggest city. Paired uncomfortably with a world-class beauty like Prague, it's a dowdy Birmingham to Prague's imperial London. Then there's the matter of the difficult-to-pronounce name (it's "BURR-no"). But for a brief 20-year period following World War I, the capital of provincial Moravia took center stage when it came to modern architecture, outshining its more famous Bohemian rival and establishing itself -- fleetingly -- as one of the Continent's most exciting places to build and design. A surge in what would become known as "Functionalism" produced several important buildings in Brno -- from private residences to office buildings and even a crematorium. "Brno was one of the most-important centers of Functionalist architecture -- not just in Czechoslovakia, but in all of Europe," says Zdeněk Lukeš, a former chief architect at Prague Castle and one of the country's leading architecture critics. Lukeš says that Brno in the late 1920s was a rich city endowed with young and progressive leaders. Functionalist architecture seemed a perfect fit. Europe at the time was looking for new architectural styles, and Functionalism -- a stripped-down aesthetic that managed to be both chic and populist -- caught the eye of the avant-garde. Many of the early Functionalist architects -- Le Corbusier, Walter Gropius, Ludwig Mies van der Rohe -- later became international household names. 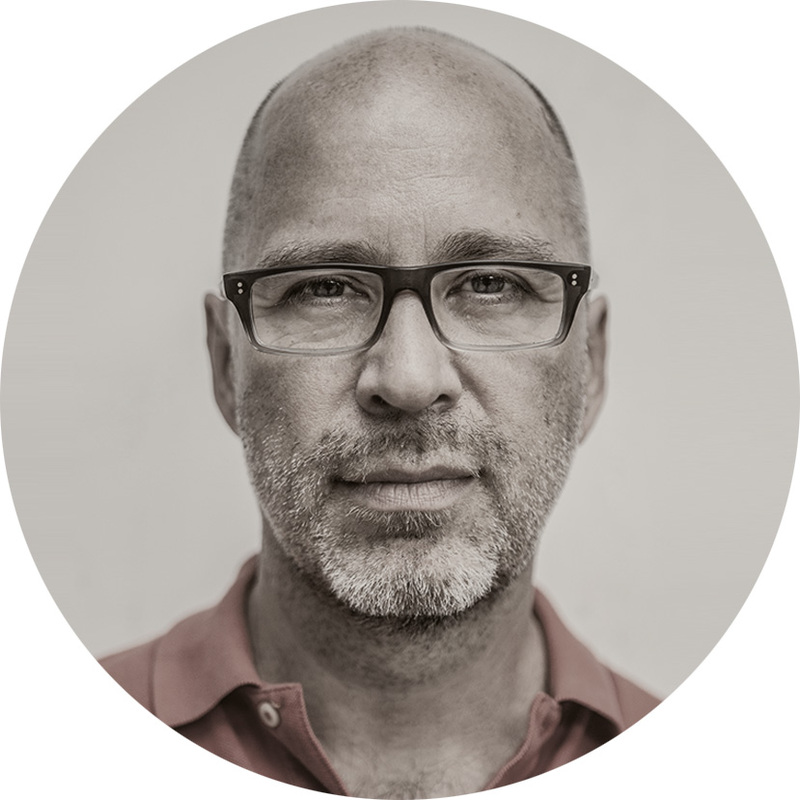 These young architects designed buildings according to a new creed: "Form Follows Function." 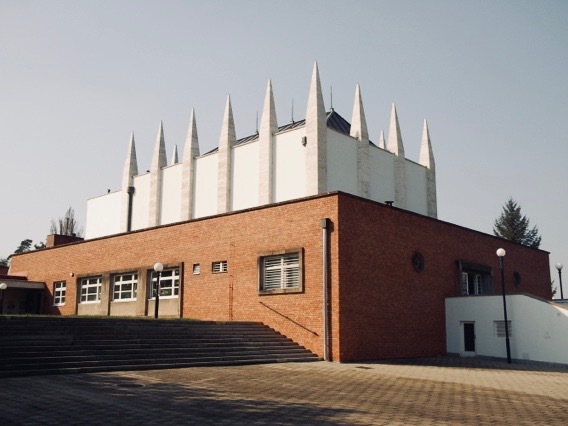 Vladimír Šlapeta, the dean of the architectural faculty at Brno's Technical University when I spoke to him for this story, says the Brno Functionalists took that dictum a step further: to them it was "Form Follows Function, Plus Poetry." The result of that equation is seen in the hundreds of surviving Functionalist buildings scattered throughout the city, where they contrast nicely with the usual Baroque and Neoclassical splendor. The good news is that much of this architectural heritage -- including a masterpiece by Mies -- is still available to anyone willing to make the two-hour car or train journey from Prague or Vienna. The bad news is that many of the buildings face an uncertain future, lacking the proper historical protection and threatened by insensitive restoration. Miroslav Ambrož, a noted architectural historian, says that after the fall of Communism in 1989, many of the buildings were returned to private hands, but that the new owners often weren't interested in historical preservation. He says city officials know they must protect the buildings, but the laws and the means at their disposal are weak. "The city," he says, "is often powerless to do anything against the new owners." No matter what shape they're in, the buildings reflect an important period in Brno's, and the whole country's, history. In the 1920s, independent Czechoslovakia had just been carved out of the defunct Austro-Hungarian Empire and the fledgling democracy was ready to embrace a new architecture -- one that signaled a clean break from the past. 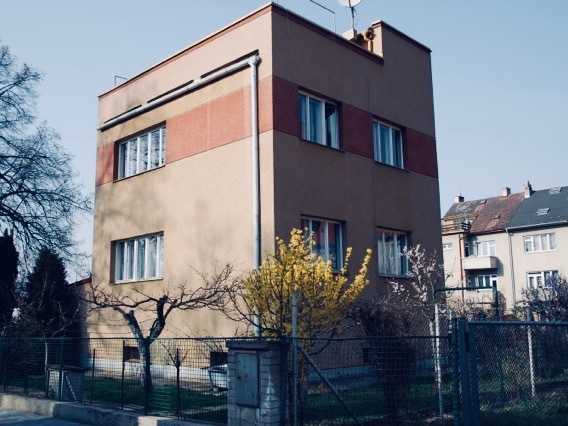 One of the cute cubed houses of the Brno 'Nový Dům' colony, a suburb of 'Functionalist' housing built for the 1928 Czechoslovakia exhibition on the country's 10th anniversary of statehood. Photo by Mark Baker. 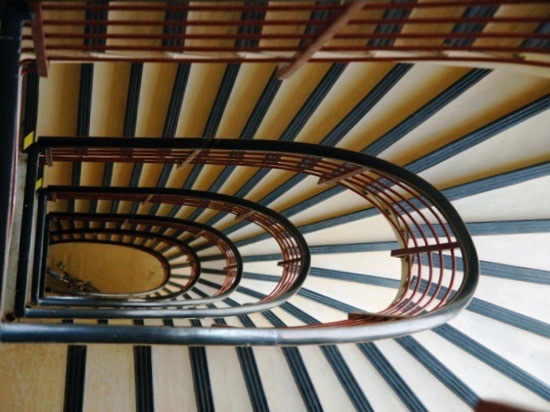 Many of the exteriors hide simple but intricate designs, such as this stairway, which is part of the former Union Bank building. Photo by Mark Baker. A snippet from the interior of the now-closed Hotel Avion. Photo by Mark Baker. The tatted-up exterior of Fuchs' Hotel Avion, a classic 1928 Functionalist building which has been allowed to fall into disrepair. As local critics point out, not everyone knows the history of these buildings. Photo by Mark Baker. For more than a century, the Habsburgs had imposed a strict (and frankly, dull) Neoclassical architectural style on the hinterlands – demanding faux columns, pediments, and over-the-top decorative elements that appealed to the middle classes, but left real architects cold. In the late-19th century, this gave way to the more satisfying Art Nouveau and Secession movements, but even then the emphasis remained on decoration over design. By the 1920s, an avant-garde group of architects had begun stripping away the ornamentation. 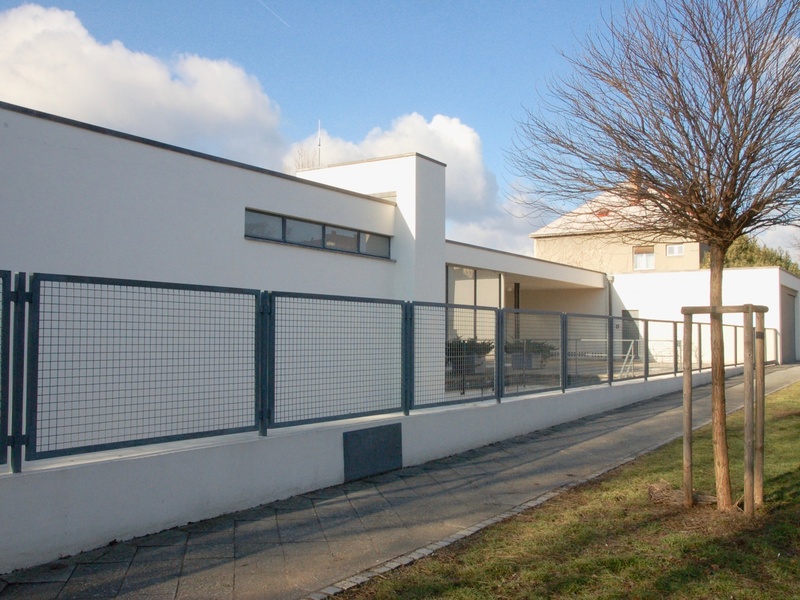 Functionalism, also known as Bauhaus, got its start in Germany in places like Weimar, Dessau and Stuttgart. In Brno, a group of young architects, most notably Bohuslav Fuchs and Arnošt (Ernst) Wiesner, also embraced the functionalist aesthetic. Gone were the pillars and pediments, the stucco and statuary, and anything else that didn't have to be there. In Brno, as in those architecturally adventurous German cities, less was suddenly more. At their best, the new Functionalist buildings, with their simple façades, look arty and honest compared with the overly ornate 19th century palaces they replaced. But the Functionalist legacy is a mixed one. Some see the movement as an architectural misstep that ultimately led in subsequent decades to the sterile modern skyscrapers that dominate city skylines around the world. 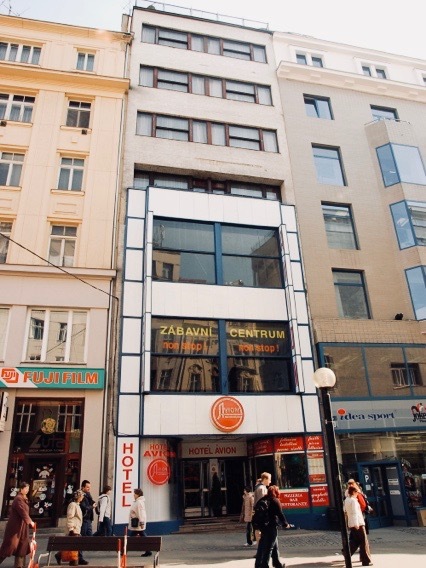 To many Czechs, the Functionalist buildings -- with their flat roofs and rectangular windows -- also resemble the stark, mass-produced buildings that were built later by the communists. But experts say that comparison is unfair. Ambrož concedes the styles may appear similar, but the underlying philosophies are very different. The communist buildings, he says, weren't architecture at all; they were built completely from prefabricated designs and construction materials. By contrast, the functionalists treated each project individually. Every detail was carefully designed and executed by skilled craftsmen. The modern facade of the Wiesner-Fuchs Functionalist collaboration 'Moravian Bank Building,' on central Náměstí Svobody. Photo by Mark Baker. The simple beauty of Brno's 'Nový Dům' colony. Most of the houses here are in private hands and not open to the public. Photo by Mark Baker. In the 1920s, Brno was a hotbed of modern architecture and still boasts many of the Czech Republic's most distinctive "skyscrapers." 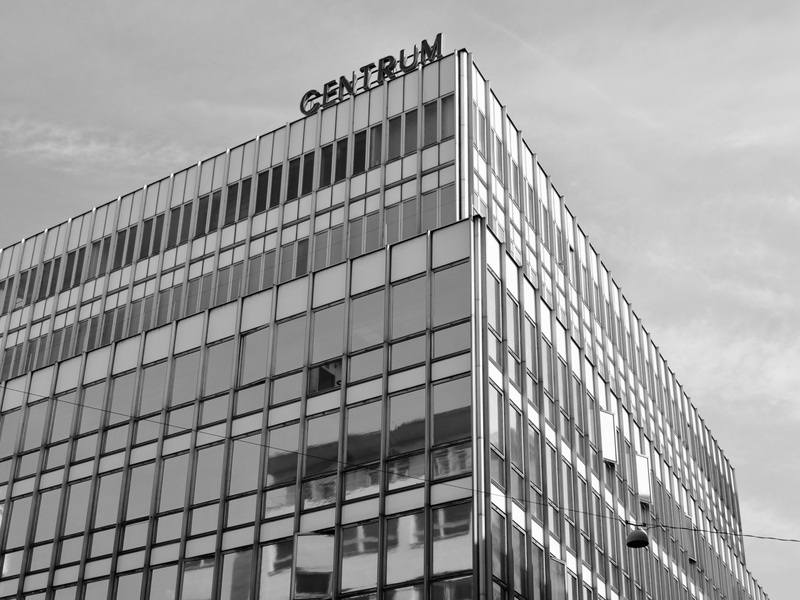 Here the Functionalist Centrum department store. Photo by Mark Baker. Pavilion A at the Brno Exhibition Grounds. The building's smooth curves turned heads at the 1928 "Czechoslovakia" exhibition. Photo by Mark Baker. A tour of Brno's architectural treasures begins in the city center, where you'll a find a concentration of impressive buildings and, importantly, the tourist information office. An excellent free map, "Modern Architecture in Brno," points out 44 buildings and includes plenty of photos to give you an idea of what you're looking for. Many of the buildings are reachable on foot or by public transportation in the compact city center; others require a drive to the nearby suburbs. 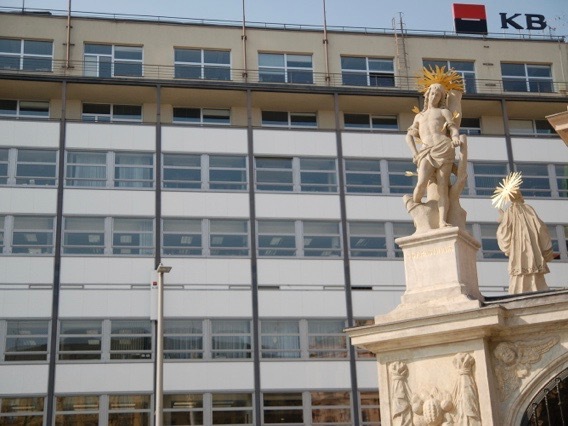 A five-minute stroll from the tourist office takes you to three buildings worked on by Fuchs and Wiesner -- both of whom had come to Brno (Fuchs from Prague and Wiesner from Malacky, in what is now Slovakia) in the 1920s as modernism was taking hold in the city. Fuchs's penchant for radically modern simplicity can be seen in his Hotel Avion (address: Česká 20). Built in 1928, the Avion is sadly a shell of its former self and badly run down. Fuchs used slender horizontal windows to transform the building's narrowness -- barely six meters across -- into an asset. The exterior is still striking, but the cheaper materials date from a botched reconstruction carried out in the 1980s. The former Union Bank building (now the regional office of Czech Radio) at Beethovenova street no 4 is from Wiesner, who had a more unorthodox style than his contemporaries and often added unexpected flourishes to his otherwise spare creations. Much of the original interior, save for the gorgeous spiral staircase (see photo) has been destroyed, but the exterior still shows the original design's harmony and simplicity. Not far away, on the town's main square (Náměstí Svobody 21), is a Wiesner-Fuchs collaboration, the former Moravian Bank building (now a branch of the Czech Komerční Banka). Built just after the Avion, it uses a similar horizontal façade – this one of alternating white and glass -- as a way of supplanting the columns and pediments of earlier years. The exterior has been restored to its original appearance, but the real attraction is the airy lobby, in keeping with the functionalists' philosophy to eliminate interior walls and open up sight lines. It's still a bank, so you're free to visit during working hours. A second group of buildings lies in the Černá Pole suburb, north of the center. Here you'll find Mies's sleek and storied Villa Tugendhat (Černopolní 45), included on Unesco's list of World Heritage Sites. Mies designed the house in 1930 for a wealthy Jewish couple, Fritz and Grete Tugendhat, who were forced to flee the country just before World War II. The building is open to the public -- though you usually have to book well in advance over the website to book a guided tour. The Tugendhat is undeniably impressive. Its sleek, angular exterior is largely intact (albeit with a few cracks here and there). Inside, it's still possible to appreciate the groundbreaking floor plan, even if some of the period furnishings -- including pieces Mies designed especially for the house – are missing. The Functionalists sought to gain efficiencies from integrating the living and dining spaces. Here, Mies used special iron supports to eliminate load-bearing walls and more fully open up the interior. The main dividing wall is of high-quality onyx, lending a feeling of warmth and permanence. The Tugendhat's airy interiors later inspired novelist Simon Mawer to write his moving "The Glass Room," a fictional account of a wealthy Jewish family living in a city called 'Mĕsto' and forced to flee the country with the coming of the Nazi occupation in World War II. Walking the residential streets of Brno is a delight, with funky 1920s and '30s houses on seemingly every street corner. Photo by Mark Baker. Wiesner's municipal crematorium shows off some spare decorative elements, such as pillars that line the roof and suggest a Mesopotamian temple. Photo by Mark Baker. Just west of the city center, about 15 minutes away on foot or a short taxi ride, are the Brno Exhibition Grounds, site of the city's greatest concentration of functionalist buildings. It was here in 1928 that Brno hosted a landmark exhibition marking Czechoslovakia's 10th birthday as an independent country. The event brought together the best architects of the time. 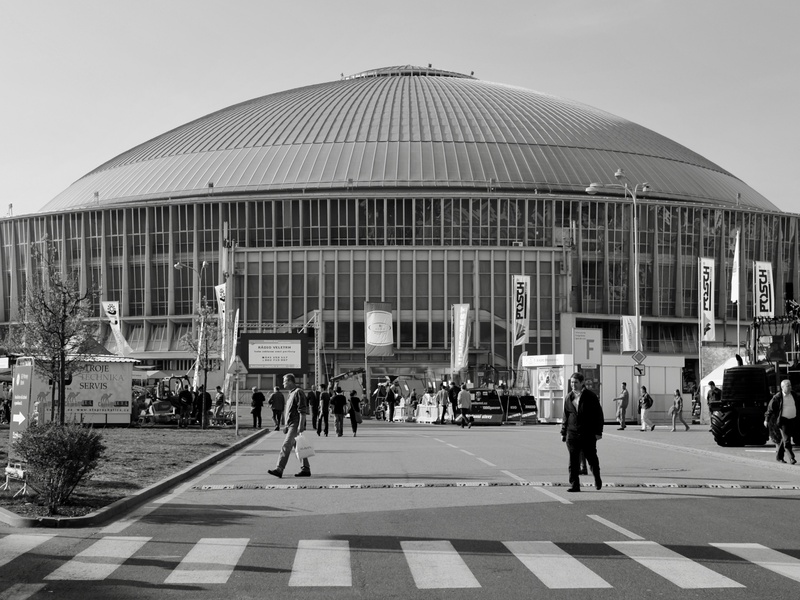 The area still hosts trade fairs, and the decades since the original exhibition have seen the addition of dozens of new buildings. But here and there you can still see the architecturally interesting original structures, including the vaulted main building, Pavilion A. To the northwest of the exhibition grounds (and requiring a car or taxi), is a rare example of an early Functionalist housing development. The Nový Dům (Czech for "New House") project was originally conceived as part of the 1928 fair. 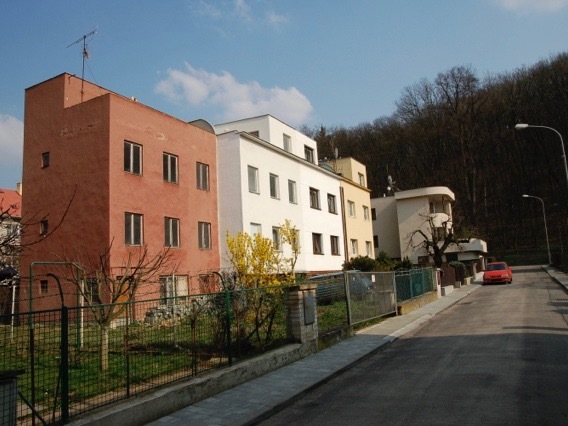 Nine architects, including Fuchs and Wiesner, designed 16 houses on three tiny blocks (along Drnovická, Šmejkalova and Petřvaldská streets) as model homes for ordinary people. Unlike the Tugendhat, there was no attempt here to use expensive materials. This was Functionalism for the common man. Instead, the emphasis is on simple, elegant designs -- in effect, unadorned building blocks (especially along Drnovická) – that could be reproduced cheaply. Though they were conceived as affordable housing, their scale is much smaller and more pleasing than the prefab, public-housing blocks built in the 1960s and '70s -- panelaky -- that now surround the outskirts of many Czech cities. There are dozens of other buildings worth seeing in Brno. Perhaps the most unusual is the city's startling Crematorium (see photo), at the western edge of town near the municipal cemetery. Another Wiesner creation, the building's basic shape is of a box on top of a bigger box. But Wiesner added spare decorative elements -- pillars around the upper stage -- to suggest a Mesopotamian temple. 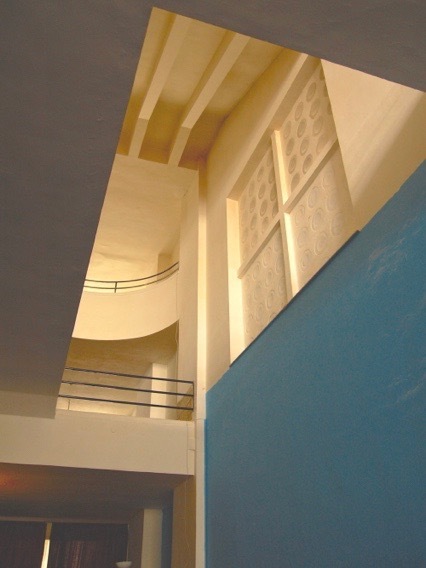 The interior, in Functionalist style, is simple and open. Visitors are allowed to walk around inside, but keep in mind the building is still in use as a crematorium. 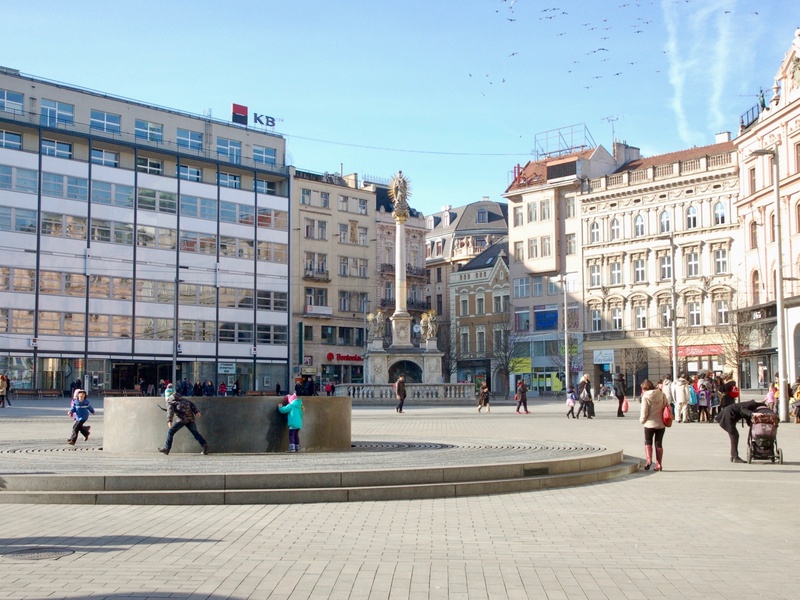 Central Náměstí Svobody (Square of Freedom) shows off both Brno's modern architecture and its more traditional past. Photo by Mark Baker. 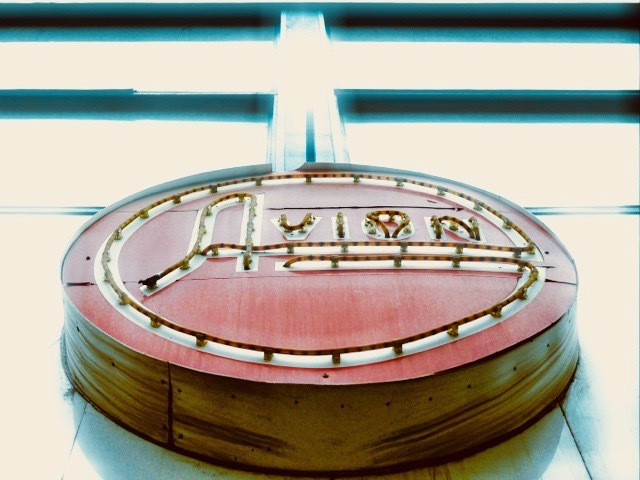 The seal of the dilapidated "Hotel Avion," a Functionalist survivor on one of the liveliest pedestrian streets in the center of town. Someday, investors will recognize the property's full potential. Photo by Mark Baker.